Helps moisturize the skin after aesthetic procedures. 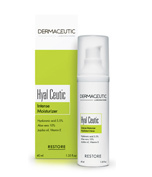 Hyal Ceutic provides essential nutrients to keep the skin hydrated all day. The highly active formula boosts the skin’s recovery and provides optimal moisturizing, soothing, firming and superior skin comfort.